Although enhanced recovery after bariatric surgery (ERABS) has proven to be safe and cost-effective, this concept is relatively new in the Middle East. 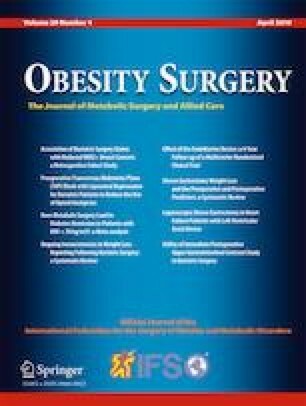 A retrospective analysis of consecutive registered cohorts of patients who underwent primary and purely laparoscopic sleeve gastrectomy (LSG) or laparoscopic Roux-en-Y gastric bypass (LRYGB) were compared before introduction of ERABS (2010–2014) and after ERABS (2015–2017) at Tawam Hospital/Johns Hopkins, the UAE. A total of 462 eligible bariatric patients (LSG 414 and LRYGB 48) were operated on before and 1602 (LSG 1436 and LRYGB 166) after introduction of the ERABS. Significant improvements of mean patient time of the patient being within the OR for LSG (from 2:27 to 1:23 min, p = 0.000) and LRYGB (from 3:17 to 1:59 min, p = 0.000) were achieved when comparing pre-ERABS with after introduction of ERABS. Furthermore, there was a significant decrease in LOS in both LSG (from 3.2 to 1.5 days, p = 0.000) and in LRYGB (from 3.5 to 1.7 days, p = 0.000). Major (CD classification III–IV) complications decreased significantly in LSG (from 13.8 to 0.8%, p = 0.000) and were similar in LRYGB (from 4.2% to 3.0%, p = NS). The readmission rate for LSG (from 2.9 to 2.6%, p = NS) or LRYGB (from 0 to 4.8%, p = NS) and the reoperation rates after LSG (from 0.7 to 0.5%, p = NS) and LRYGB (from 0 to 2.4%, p = NS) did not differ between both groups following introduction of ERABS. Implementation of a standardized ERABS program in the Middle East is feasible and safe and leads to reduced LOS and OR times. Ethical approval for this study was obtained from the scientific board of Tawam Hospital/Johns Hopkins, Al Ain, The United Arab Emirates (AAMDHREC Protocol No. 527-17).